Backstage at the Baltimore Symphony after the concert. Left to right: Kathy Voytko, Marie Zamora, Alain Boubill, Terrence Mann, Jennifer Paz, Eric Kunze at Baltimore Symphony. What an Evening it Was! It was an evening of non-stop hit after hit after hit. 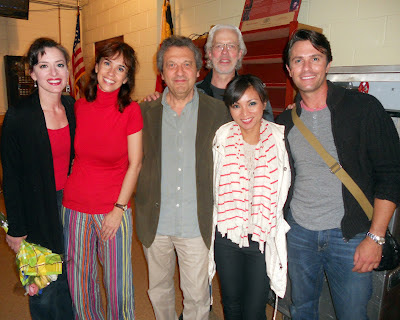 Many in the audience may not be Broadway afficionadoes or familiar with the music presented, but the audience was spell-bound by the five soloists: Eric Kunze, Jennifer Paz, Kathy Voytko, and Marie Zamora and the incredible Terrence Mann." "Bring Him Home was performed brilliantly by Kunze." and goes on to describe the thrilling conclusion of the concert. (From Maggi) This is some of the feedback from the series of concerts in Baltimore this weekend. Thank you ALL for your input! Susanne: If I told you that the concert was phenomenal, it would still be an understatement! Where do I even start to tell you about it! The goosebumps started when the orchestra played some selections from Miss Saigon as the overture. Eric came out after Terrence Mann and Jennifer Paz each sang a song. He looked quite handsome in a black suit and shirt and later in a tuxedo. I was completely mesmerized when Eric sang, "Bring Him Home". How does he hit those notes so effortlessly? I was so taken with the power of his voice. I kept thinking that it's Broadway's loss if they don't sign him for Phantom. Many times during the night I had to catch my breath when I heard his ability to push that wonderful voice to the limit! He just keeps getting better and better. Jeannine: I really enjoyed this show.. 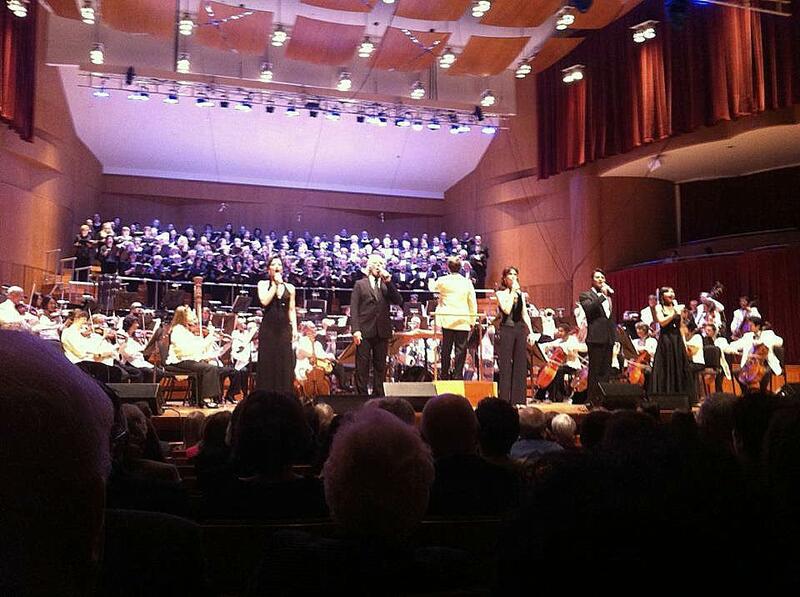 The conductor, chorus, and orchestra did a phenomenal job, as did Eric, Terrence, Jennifer, Kathy and Marie. The show opened with one of my all time favorite songs, Bui Doi, from Miss Saigon…Terrence Mann and the choir were beautifully powerful. “Last Night of the World” sung by Eric and Jennifer was just amazing…They showed such a high level of chemistry and comfort with each other, obviously a result of their working together as Kim and Chris through the years, that I was drawn into the storyline wholeheartedly. 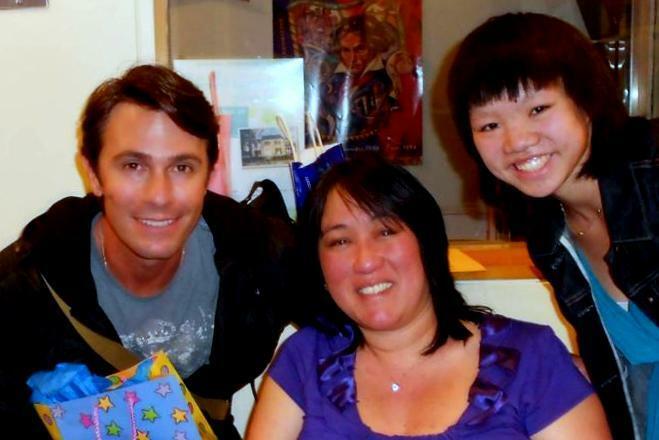 The audience was told that there would be a concert version of Miss Saigon in 2013, something I would love to see! Kathy debuted a new song called “Maybe” that helps the audience understand some of the angst her character, Ellen, goes through. She did an excellent job with this song. Jennifer also did a great job with "Too much for one heart." It would have been nice to have it stay in the final version of Miss Saigon. Not being familiar with Martin Guerre, I was interested in hearing Eric sing “Martin Guerre.” As always, his clear diction and pronounciation, helped to draw me into the story he and Marie were telling. 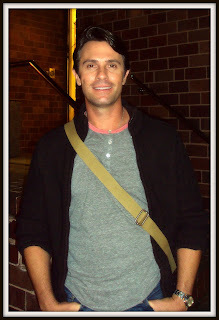 I also enjoyed Marie, singing in both French and English during “In My Life..” So beautiful… One of 2 highlights for me was being able to hear/see Eric sing the role of “Marius” during this concert, especially as I had never had the opportunity to see him as Marius on Broadway (his first role there J) “Master of the House” was a fun number, as always, and Kathy and Terrence did a great job with it. As I had seen Terrence Mann on Bway, in Les Mis, as Javert, it was a treat to hear him sing “Stars” again.. such a tragic song. The piece de resistance for me was hearing Eric’s version of “Bring Him Home.” He always acts through his songs, in my opinion, vs. just singing a song to get to the end, which definitely draws me into the story and engages me in whatever song he is singing, especially beautiful and well done, with this song. I wish I could hear it again and again—so, so, so expressive.. brought me to tears. I really loved that Alain Boublil performed at the end, with the ensemble.. This was a top notch production that had me wishing for more! Riki: "Hi! Finally home, and let me tell you- that concert made every minute of the last couple crazy days worth it!!! There aren't words to tell you how awesome it was- all the rumblings you have heard are true and more! The whole cast is immensely talented! There were several songs that I had never heard before; that was a treat. Eric gets more talented every time I hear him! He sang a couple of standard faves, but for me the highlights of the night were Martin Guerre - it made one want to jump up, throw your fist in the air and cheer with him! The wedding song from The Pirate Queen made me cry, it was so sweet and poignant! Wow, just wow..... I can honestly say, that out of all the things I've seen yet- this was by far the best!!!! Wish I could see it again! 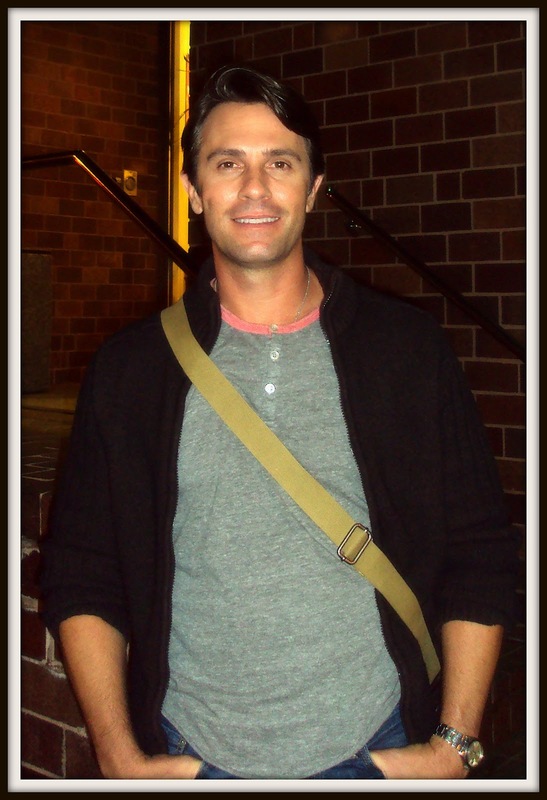 He did a couple duets with Marie Zamora that were new to me and absolutely beautiful. Have I said wow enough yet? I am still blown away and it has been almost 24 hours! Eric will be back at Music Circus again this summer. Stay tuned for all the details! Break a leg at the Meyerhoff! Tonight's performance of "Do You Hear the People Sing?" with the Baltimore Symphony will be at the beautiful Meyerhoff Symphony Hall through Sunday. 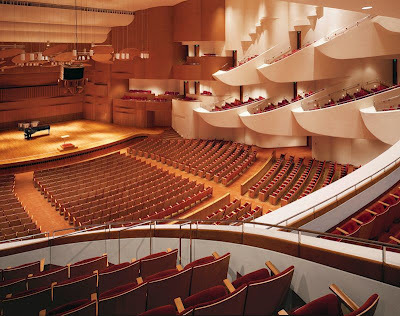 The hall has a capacity of 2443 people! Break a leg Eric and the cast and crew! We know you are going to be wonderful! Looking forward to a report and hopefully some pictures from fanclub members Anita, Jeannine, Courtney, Susanne and Sherri who will be attending. It turns out the programs for the Pittsburgh and Baltimore concerts were printed before Eric was hired. As a result the program lists Peter Lockyer instead of Eric Kunze. Even if there was an error in this article, I am putting a link here for you to read. It was Eric, not Peter Lockyer, on stage that night. Don't miss the remaining concerts in this wonderful series! See post below for details and ticket information. "Do You Hear the People Sing" featured an exceptionally strong roster of vocalists, all of whom projected their words with the utmost clarity. 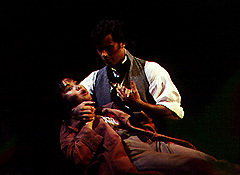 (Jennifer) Paz sang "Last Night of the World" with tenor Peter Lockyer, [from Maggi: this is SUPPOSED TO READ "ERIC KUNZE", not Peter Lockyer] a colleague she'd met in the first touring company of "Miss Saigon." He was a persuasive romantic leading man, yet also had the steel for the song "Martin Guerre." Break a leg Eric and cast and crew of "Do You Hear the People Sing"! Eric fans, this is our "Dream Concert" come true. Eric will be joining four other artists singing the wonderful music of the creators of Les Mis, Saigon, Martin Guerre, Pirate Queen with four different symphonies. Eric and Lea Salonga on Broadway in "Les Miserables"